As the world progresses relentlessly into the future, constantly striving for the bigger and better, Conor Walton uses paint to remind us all of the fragility of our world. On display through December 7 at the outstanding CK Contemporary is a fascinating solo exhibition of paintings by Conor Walton, a man whose artistic mission is to cultivate a broader perspective among his viewership. A self-described “enemy of progress” — alluded to in the title of the show — Walton views culture as simply a “façade,” a modern ruse that distracts the masses from the larger, more natural forces that may ultimately shape our destiny. However relevant Walton’s concept may be, the messages are communicated with extreme beauty. 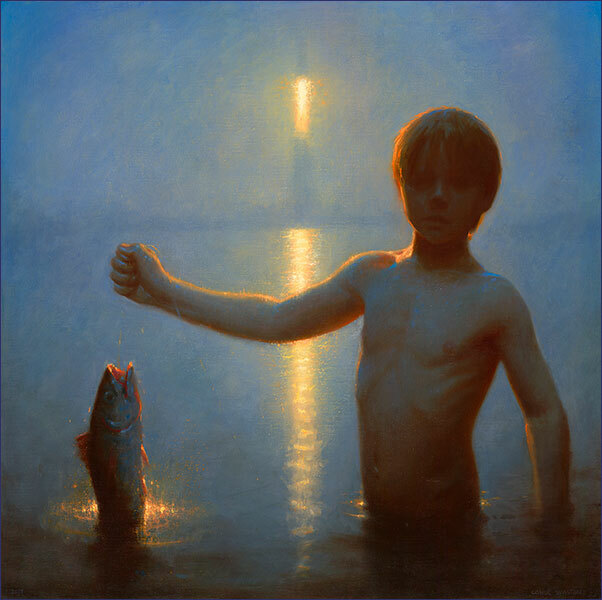 “Phaethon” is a gorgeous painting displaying an adolescent boy waist-deep in water. The subject holds his left arm out, displaying for the viewer a fish attached to a line. Along the horizon, a large architectural form rises from the haze, its peak brightly illuminated. The naturalism and luminance are absolutely stunning. Whether through the works’ profound beauty, weighty message, or both, the exhibition is sure to delight viewers over the next few weeks. “The Enemies of Progress” will be on view at CK Contemporary in San Francisco, California, through December 7.